Remember Frontiers? It's basically The Elder Scrolls as created by two indies, and now it's getting hang gliders on top of everything else. You can fly around its massive world and just drink in the sights. That got me thinking: hang gliders are really great. Why don't more games have them? Hang gliders are a severely underrated means of travel. They're not too fast, but not too slow. They really are just right. I have no doubt that Goldilocks traveled to the Three Bears' house on one. They add a certain relaxed thrill to flight. Like, they don't soar along like jets, but there's a certain stress to the fact that you're slowly descending and sometimes outright swooping. A good stress, an exciting stress. And yet, they still manage to be slow and soothing, letting you look around in all directions and really appreciate your surroundings. 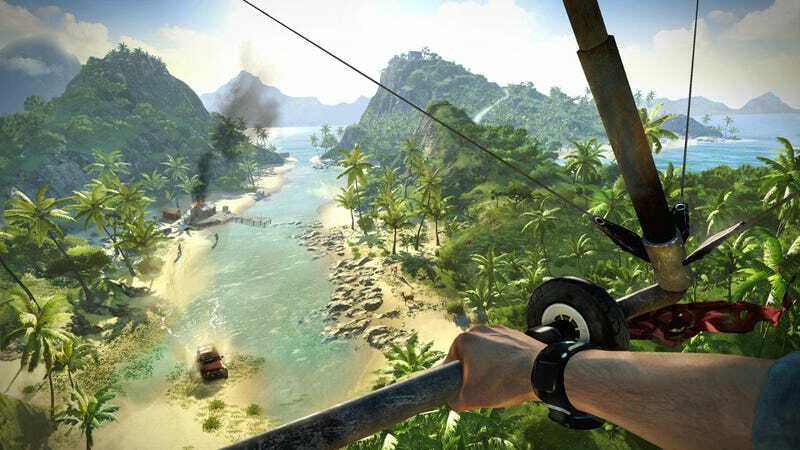 Here are a few examples of great video game hang gliders. Developers take note: more of these. First of all, let's check out the new Frontiers footage, which doesn't quite have speed or momentum down yet, but is so gosh darn relaxing that I want to buy a bed shaped like a hang glider. Fun, right? But hardly gaming's best hang glider. The list of games that include hang gliders is rather depressingly small, but I'm pleased to report that many of them go all-in with the idea. Probably one of the most well-known examples is the Far Cry series, which has let players languidly bob through the skies since day one. Most recently Far Cry 3 let players fly like incompetent, overly heavy eagles, and it was grand. More creative players, however, realized hang gliders could also be used as weapons. Watch these soldiers get a very unpleasant (and explosive) surprise. It's certainly one way to make an entrance. Also Kirk said I had to mention Far Cry 2's hang glider, which he just reminded me was purposefully terrible, carrying you a whopping 20 feet or so on immaculate manmade wings before usually giving out and killing you. Ah, Far Cry 2. Such great memories. Nintendo may well be gaming's foremost hang glider enthusiast, having featured them in more than one whole series. Cases in point: Mario Kart and, of course, Pilotwings, which has made extensive use of hang gliders since the Super Nintendo days. Even now, it's sort of oddly beautiful. So that was then, and here's Pilotwings Resort for 3DS now. The more things change, the more they stay the same, etc. Assassin's Creed has also done hang gliders, albeit not really in the modern sense. Ezio's hang glider in Assassin's Creed: Brotherhood was more super-powered parachute than sleek, aerodynamically optimized sky surf board, but it also allowed for AIR ASSASSINATIONS, so I feel like it balances out. It lacked the versatility of, say, Far Cry 3's truly peerless hang glider, but who hasn't wanted to be a languidly floating angel of death? And of course, who could forget the most famous paraglider (that's the real term; I just looked it up) of all? Just Cause 2 allowed players to yank a ripcord and deploy one of infinity paragliders at any given moment, often while grappling onto cars and helicopters and planes and a giant zeppelin dance party called The Mile High Club. Related: Just Cause 2 is one of my favorite games of all time. No other game has offered this degree of control with a gliding setup. The grappling hook changed everything, allowing you to change direction and speed on a dime if you knew what you were doing. Or just fall hundreds of feet or run face-first into a mountain or get hit by a plane or... anyway. Most importantly of all, Goat Simulator has a hang glider, because of course Goat Simulator has a hang glider. It's not as robust or well-crafted as some of the others I've highlighted, but it's a goat hang-gliding. Points must be awarded for that. A lot of points, which is pretty well in line with the game, seeing as it kind of just gives you points for whatever. The twist, however, is that it's a secret goat hang-glider. Also, you don't get to pilot it because who would let a goat pilot a hang-glider? The very notion is downright preposterous. Sheesh. Do you share my strangely specific adoration of video game hang gliders? If so, what's your favorite? Share with me your tales of derring do and (brief) gravity defiance.